If you would like to suggest a location for an event, please feel free to contact me by filling out this form. Description – I will be featured along with several other authors for this event, and signed copies of both my books will be available for purchase. Description – Part one of an ongoing class on creative writing for kids in honor of the summer reading program. Description – Part two of an ongoing class on creative writing for kids in honor of the summer reading program. Description – The final meeting of an ongoing class on creative writing for kids in honor of the summer reading program. Description – Millie has agreed to join the Children’s Book Club to talk about her most recent book, Lydia Green of Mulberry Glen. Description – I will be attending the 2019 Realm Makers conference this year! If you’re planning on going, let me know, I’d love to meet up with you! I’ll have several copies of my books with me if you’d like to buy a signed one! Date – Wednesday, April 10th, 2019, from 11 am to 1 pm. Description – I’ll be speaking to Erin Wooldridge’s writing class at the Hearts for Scott Homeschool Co-op. At lunchtime, books will be available for purchase and signing just outside the building. Description – A fun come-and-go event for the release of Lydia Green of Mulberry Glen. There will be book themed refreshments plus actual books! Stop by and pick up a signed copy of Millie Florence’s most recent book or bring your own to be signed by the author. Special $10 price! Cash only. Schedule: 5th Grade – 8:30 am, 7th Grade – 9:20 am, 8th Grade – 10:10am, 6th Grade – 1:00 pm. Description – I’ll be reading an excerpt from my most recent book in celebration of Reading Across America Day. Description- Bring your kids for a fun-filled evening of unleashing their creativity! 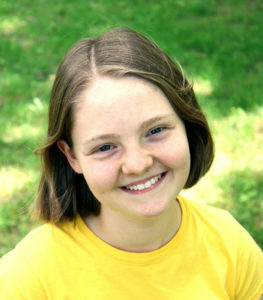 Millie Florence will teach kids ages 12 and under about how to come up with and create great stories. There will be a private Q & A and copies of Honey Butter for sale. Note – advance sign up required. Call 242-6322 to sign up! Description – I will be one of the featured authors at the Saint Louis Indie Bookfair. Come to pick up a signed copy of Honey Butter and chat with me! Description – I will be attending the 2018 Realm Makers conference this year! If you’re planning on going, let me know, I’d love to meet up with you! Date – Wednesday, September 6th, 2017 from 5 to 6:30 pm.